Over the years, I haven’t been shy about talking about my issues with food. I’ve been pretty candid about how certain foods are triggers to me, how I’ve struggled with emotional eating, and how I’m taking it one day at a time. 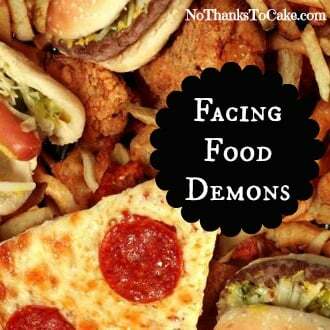 Today… I’m talking again about the food demons, and how I’m facing them. Since I got back on the Jenny Craig program at the beginning of the year, I’ve been amazed at how at peace I’ve been with food. I mean, I haven’t conquered all of my food demons, but I’ve felt amazingly calm about all of my meals and the process. Mostly, I feel in control. Now, I’m quite type-A and a total Capricorn… so I tend to like to be able to control my world, so the satisfaction I feel feeds who I am… but it’s really more than that. I’ve been “on a diet” for most of my life. And, I feel like I’ve lived trying to avoid things like Reese’s Cups, baskets of chips and salsa, and a box of Wheat Thins. 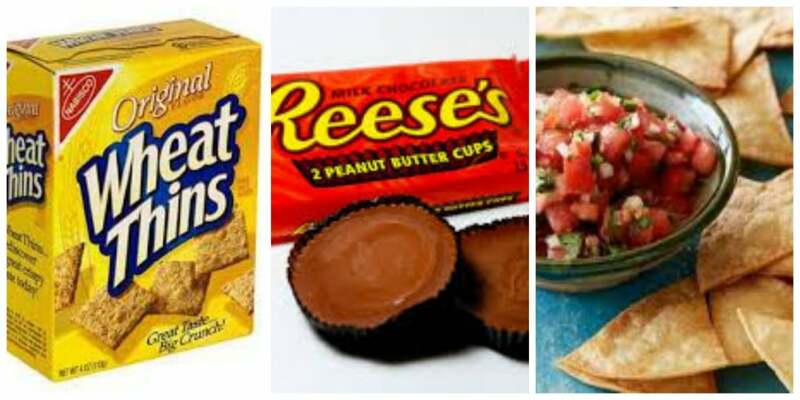 Yep, we’re talking about American snack food…. but they’re some of the hardest things for me to resist. And, yes… I get that “everything in moderation” is an excellent motto, but when you can’t moderate… When you can easily find the bottom of a can of Pringles in about 30 minutes, when you can throw back an entire pizza in one sitting, you need a plan B. For me, that means avoiding these foods like the plague. I don’t buy them, I try not to be around them, and please (for the love of God) if we can just skip having the bread basket on the table at dinner, that would be great. 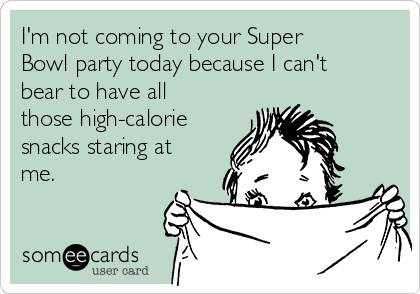 Now, consuming the calories may be devastating to my waistline, but that really isn’t the brunt of the problem. The biggest challenge I face with these trigger foods is the way I treat myself after a big ol’ binge. While I try to be kind to myself, there is often a tiny voice in my head that is just not friendly… and PS, she can be relentless. Seriously, you ate all of that? You SAID you were going to eat single servings of that. Have a little control, Kelly! How are you going to lose weight if you keep this up? Yeah, that’s the not-so-pretty stuff that happens to so many of us… that can be embarrassing to share. And, frankly, I know that my comfort in sharing this detail is because I’ve got a muzzle on that girl right now. And, honestly, skipping Super Bowl festivities this weekend had everything to do with keeping that muzzle in place. [pinterest]Sometimes we have to make sacrifices for our mental and physical well-being… and for the peace I feel today, I know it’s so worth it. Having a plan and eating on my plan actually helped me to say no. I don’t always say no, and I definitely don’t sacrifice much in the social department. But for one day, it helped me feel ok about skipping the parties, and it even helped me to put down the Cadbury Mini Eggs that I held in my hand for a moment at the grocery store yesterday. Knowing that I have a plan and have everything scheduled is helping me to quell my food demons. They’re quiet for now, and I couldn’t be more thrilled. I absolutely know that I’ll face them again, and in the meantime, I’m trying to learn as much as I can and to enjoy the success I’m seeing along the way.